Intriguing narratives and disturbing anecdotes rang clear with a glut of verbal emesis that kept emotion in suspense at the meeting of royal Fathers in Ondo state. The mood was moron while the faces were obviously unfriendly, but the monarchs were bonded by a unity of purpose which was to draw the attention of government to their plights through a nagging message. 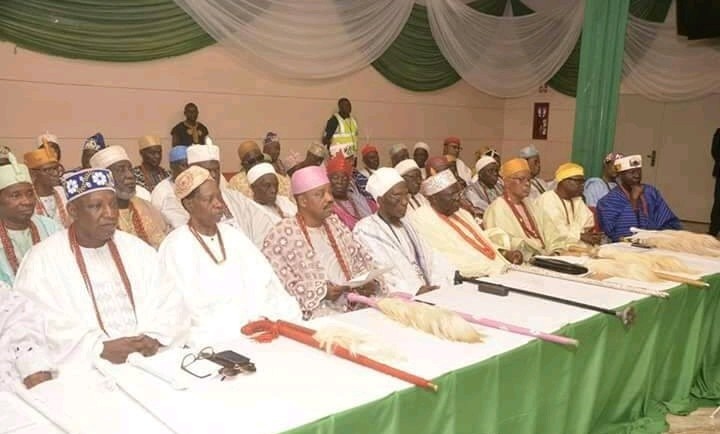 At the meeting, which was held in Ibaram Akoko in the state Northern senatorial district over the weekend, the council of Obas who are challenged by a similar problem, decried the state of Insecurity and deplorable condition of infrastructure. Although, the state government had earlier flagged off series of road projects, they seem to have had more of political narration than meeting the needs of the people. According to Oba Olusegun Akinbola, the Aladeokun of Alade Idanre, the state and it's people cannot be suffering and smiling. "Our people are facing a lot of challenges. We know the issues we attend to in our palaces on daily basis. "Kidnapping today, armed robbery tomorrow couple with the deplorable condition of our infrastructures and our government seems to be okay with all that. "We can't continue like that. Something has to be done and it must be now." On his part, the Olu of Igbokoda, Oba Afolabi Odidiomo believed that the government does not seem to take the security of its people as priority. "We are not happy and we must make our grievances known. That is why we all left our various territories to converge in Ibaram-Akoko to speak in one voice and we believe something positive will happen going forward. Kidnapping and armed robbery have allegedly become a recurrent decima in several communities in the state with no measure taken to curtail the menace.